The Dakar rally may no longer kick off in Paris but in a way the French capital is linked with the 2017 rally. 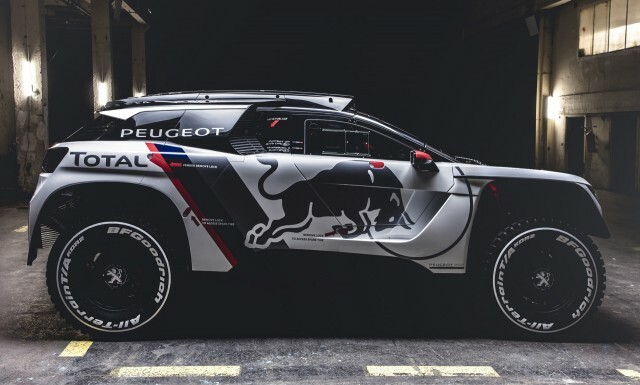 Peugeot will use the 2016 Paris auto show to present its 2017 3008 DKR, which will be competing in the 2017 Dakar rally. The 3008 DKR features a design derived from the latest 3008 SUV, which is also making its debut at the Paris auto show. The two vehicles are very different, though. The 3008 DKR is based around a custom frame with a turbocharged 3.0-liter V-6 diesel engine mounted at the rear and spinning the rear wheels only. You might have noticed the raised suspension and 37-inch tires too. Key modifications made over 2016’s 2008 DKR included improvements to the drivability and reliability of the car. The air conditioner was also beefed up after 2008 DKR drivers experienced sustained periods in temperatures as high as 140 degrees F (60 degrees C). Peugeot was the winner of the 2016 Dakar rally, thanks to star driver Stéphane Peterhansel and the 2008 DKR. However, there was some controversy this year over an extra refueling and while appeals were made, these were dismissed in a French court. The 2017 Dakar rally gets under way in Asunción, Paraguay on January 2 and will snake its way through Bolivia and Argentina. The final stop is the Argentine capital Buenos Aires. Doing the driving for Peugeot will be Cyril Despres, Sébastien Loeb, Stéphane Peterhansel and Carlos Sainz. The Paris auto show opens its doors to media on Thursday, September 29. To access our complete coverage, simply visit our dedicated hub.